Mario Kart (マリオカート, Mario Kāto) is a series of go-kart-style racing video games and spin-offs for the Mario franchise, made by Nintendo. It began with Super Mario Kart for the Super Nintendo Entertainment System in 1992. To date, there are four Mario Kart games on home consoles, three portable games, and three Namco co-developed arcade games, making a total of twelve. The lastest game for the series is Mario Kart 8. In the Mario Kart series, players compete in go-kart races, controlling one of a selection of characters from the Mario franchise. Up to eight participants can compete in each race, with the exception of Mario Kart Wii, which holds twelve. One of the features of the series is the use of various power-up items obtained by driving into item boxes laid out on the course. These power-ups include mushrooms to give players a speed boost, Koopa Shells to be thrown at opponents, and banana peels that can be laid on the track as hazards. The type of weapon received from an item box is random and often influenced by the player's position in the race. For example, players lagging far behind may receive more powerful items while the leader will only receive small defensive items. This gameplay mechanic–called "rubber banding"– allows other players or computers a realistic chance to catch up to the leading player no matter how far ahead they are. As the series has progresses, each new title has introduced new elements in order to keep the gameplay fresh. Changes typically include new items, new stages, and new methods of obtaining speed boosts, but most games have also featured a new play mechanic as well. Changes new titles have brought to the series include: Mario Kart 64 introducing 4-player racing and bringing the series into the third dimension, Mario Kart: Double Dash!! 's introducing a partner system and the Double Dash! !, Mario Kart Wii's use of motorbikes and twelve participants per race, and the newest entry into the franchise, Mario Kart 7, featuring hang gliders, submarines and a new first-person perspective as well as customizing karts. Many course themes are repeated throughout the series. For example, most games have featured a circuit course, a desert course, a city or highway course with traffic, some form of a beach course, a stadium course, a jungle course, an ice or snow course, Bowser's Castle and Rainbow Road. Each game in the series includes 16 original courses, with the exception of Super Mario Kart and Super Circuit, which holds 20. Most races have three laps, while some games have more or less. There are also three to six original battle arenas in each game, designed exclusively for Battle mode. So far, there are 120 original courses and 30 original arenas spread throughout these seven games. Additionally, there are 48 Retro courses and 10 Retro arenas. These consist of older material recreated for newer games. Banana peel: deployed as a hazard to other racers. Sometimes appears in a group of three. Green/Red Koopa shell: projectile fired at other racers. Green shells go straight and bounce off walls whereas red shells home in on other racers. Appears either as a single shell or as a group of three. Spiny shell: indestructible shell that homes in on the player in 1st place. In Mario Kart 64, Mario Kart: Super Circuit, and Mario Kart 7, it travels along the ground and also knocks down other karts in its path; in the other games it is airborne and damages the 1st placed racer only. Also known as Blue Shells. Starman: gives temporary invincibility and as well as an increase in speed. Knocks out other karts on contact. Bob-omb: A bomb that explodes after a set amount of time or on contact. Lightning Bolt/Thunderbolt: strikes all other racers with lightning, temporarily causing them to shrink and slow down. Mushroom: gives user a speed boost. Sometimes appears in a group of three. Boo: makes user temporarily invisible (to opponents) and invincible, as well as stealing another racer's item. This item has been dropped in later games. Fake Item Box: looks similar to a real item box, but is instead used as a hazard to trick other racers. Bullet Bill: Transforms the kart to an automated bullet which travels the course at a faster-than-usual speed, knocking out any kart in its path. Grand Prix – players compete in various "cups," groups of several courses each. Players earn points according to their finishing position in each race, and the player with the most points at the end of the cup wins a trophy. In some games, a ranking system is also included to determine the player's overall performance. Time Trial – (single player) the player attempts to complete any course in the fastest time possible with three mushrooms to be used at anytime during the run. The best time is then saved as a ghost, in which the player can compete against in later runs. VS – multiple human players compete against each other on any course with custom rules. Also playable in single player mode since Mario Kart DS. Battle – players use race items to battle each other in a closed arena. Each player starts the battle with three balloons and loses a balloon with every hit sustained; the last player possessing at least one balloon wins the match. In later installments, other battles have been added including throwing Bob-ombs at opponents, collecting Shine Sprites (an object found in Super Mario Sunshine) and coins. In Mario Kart Wii and Mario Kart 7, the battles have a time limit. Since Mario Kart DS, battle mode is playable in both single and multiplayer. Several Mario Kart-related items appear in the Super Smash Bros. series, with Super Smash Bros. Brawl in particular featuring a stage based on one of Mario Kart DS's courses. Certain courses from the series have also appeared in F-Zero X, Itadaki Street DS, Mario & Sonic at the Olympic Winter Games, Fortune Street and Mario & Sonic at the London 2012 Olympic Games. Various items from the series can also be seen in games such as Nintendogs and Animal Crossing. ↑ 1.00 1.01 1.02 1.03 1.04 1.05 1.06 1.07 1.08 1.09 1.10 1.11 1.12 1.13 1.14 1.15 1.16 1.17 1.18 1.19 1.20 1.21 1.22 1.23 1.24 1.25 1.26 1.27 1.28 1.29 1.30 1.31 1.32 1.33 1.34 This character is unlockable. ↑ 2.00 2.01 2.02 2.03 2.04 2.05 2.06 2.07 2.08 2.09 2.10 2.11 This character is only playable in VS Mode or Nintendo DS/3DS Download Play. Mario Kart has had a range of merchandise released. This includes a Scalextric style Mario Kart DS Figure-8-Circuit. It comes with Mario and Donkey Kong figures, while a Wario and a Luigi are available separately. It also includes CD soundtracks. A line of remote-controlled karts are available in stores. Each kart has a Game Boy Advance-shaped controller. It features forward driving and rotates when put in reverse, instead of steering. The current line-up of karts is Mario, Donkey Kong and Yoshi. There are three large karts that depict the same trio. These karts are controlled by a GameCube controller shape. Japanese figurines of Mario, Luigi, Peach, Toad, Yoshi, Wario, Donkey Kong, and Bowser are also available for purchase as well as for Mario Kart 64, figures of Mario, Luigi, Wario, Bowser, Donkey Kong, and Yoshi were made by Toybiz. 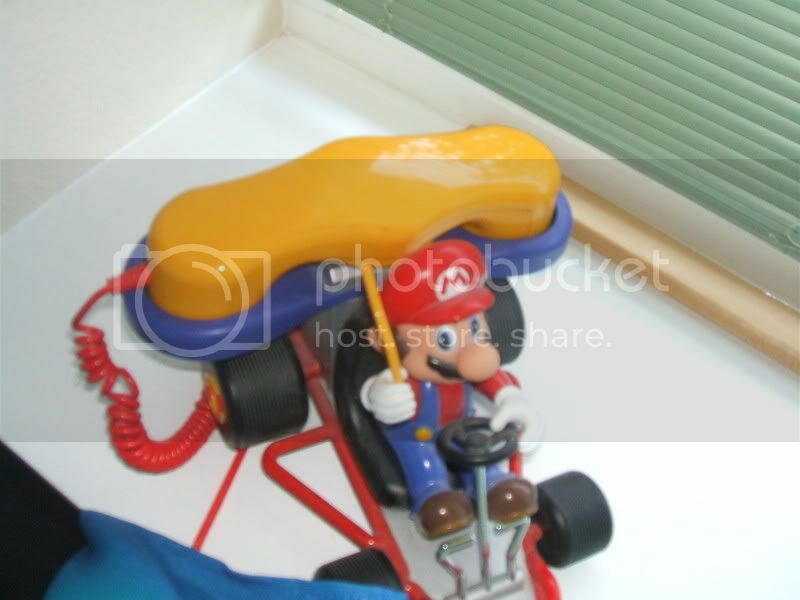 There is also a land-line telephone featuring Mario holding a lightning bolt while seated in his Kart, as seen here. K'Nex has released Mario Kart Wii sets, with Mario, Luigi, Yoshi, and Bowser in karts and bikes. Club Nintendo also released merchandise with a platinum soundtrack from Mario Kart Wii and three gold trophies from Mario Kart 7. Nintendo Power listed the Mario Kart series as being one of the greatest multi-player experiences, citing the diversity in game modes as well as the entertainment value found. Guinness World Records awarded the Mario Kart series with five world records in the Guinness World Records: Gamer's Edition 2008, including "First Console Kart Racing Game" and "Best Selling Handheld Racing Game." Guinness World Records ranked the original Super Mario Kart number 1 on the list of top 50 console games of all time based on initial impact and lasting legacy. ↑ Crecente, Brian (2009-26-2). "Mario Kart: Most Influential Video Game in History." Kotaku. Retrieved 2012-1-27. ↑ 2.0 2.1 2.2 2.3 2.4 2.5 2.6 Dan. "Mario Kart Franchise Retrospective". WatchMojo.com. Retrieved February 5, 2012. ↑ "Virtual Console バーチャルコンソール" (in Japanese). Nintendo. Retrieved 2008-07-14. ↑ "Download New BIT.TRIP Kicks, Speeding Karts, Magic Castles and More". Nintendo of America. November 23, 2009. Retrieved November 23, 2009. ↑ "Smash Bros. DOJO!!". Smashbros.com. Retrieved 2012-09-21. ↑ "K'NEX Mario Kart Wii Building Sets". Knex.com. 2011-10-20. Retrieved 2012-09-08. ↑ Ivan, Tom (2009-02-28). "Guinness ranks top 50 games of all time". Computer and Video Games. Retrieved 2009-03-14. This page was last changed on 21 April 2019, at 13:27.